A rice miller in Phichit province has successfully turned decaying rice grains back to freshness with no smell but safe for consuming. This could be an alternative for the government to store rice for a long period . Mr Prinya Thammapornpilas, an operator of Jitsermchai rice mill in Phichit, said he has discovered an effective treatment method to turn rice grains stored for a long time and are decaying and smelly back to be good grains and eatable with safety for those who favour eating old rice grains. 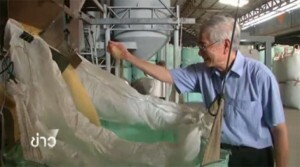 Calling his technique an ozone treatment, he said he would put the smelly and decaying old rice grains into tanks. The old rice in the tank will then be ventilated through air flow from fan to remove dust from the grains. After finishing the first ventilation and fanning step, the old rice will be put into another tank for drying with ozone to increase oxygen in the grains for 20-30 minutes. This step will help to eliminate the smell from grains. The next step will allow air to flow through all the grains to eliminate the ozone smell. This step will eliminate the smell and turn the old and smelly rice to freshness and safe for eating again. He said his mill has a capacity to treat four tons of rice grains an hour at a cost of 800-1,000 baht per ton. He said this treatment technique will be an alternative for the government to improve quality of huge rice stocks which are decaying before releasing them into the market.